This Vintage Camper seats two with a comfy double bed in the back. Completely refurbished: new engine (august 2017), new brakes, new clutch (oct 2018), double battery. New fridge and solar panel. Fully rinnovate and refurbished internally (nov 2018). The van now has beautiful wood paneling and an extandeble drawer with build in table and cutlery. The security bond for this vehicle is $1,000. The bond will be refunded after your trip ended and needs to be authorized at least 2 days before your trip starts. Simone’s van was the dream setup for our 2 week roadtrip around Victoria. He provided everything you would need, with highlights being the awesome cooking setup out the back accompanied by the awning, chairs and table. Great storage areas beneath the comfy fold out bed and touches like the LED’s, charging cables, lanterns and extra towels that made our trip so comfortable! She’s an oldie but a goldie and Simone was very easy to communicate with and catered to our every need. Would highly recommend for any van lovers! We had an amazing weekend away in Simone's van. 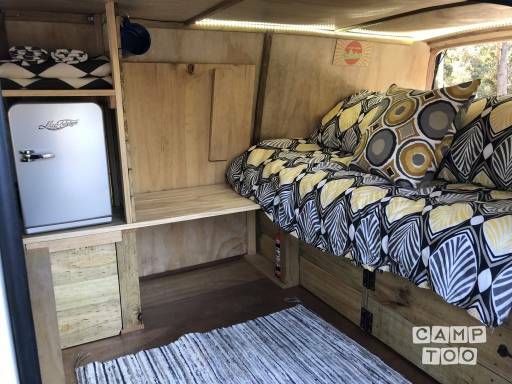 It has recently been renovated and you can tell a lot of love has gone into this awesome little van. It had everything we needed and the bed was so comfortable and cosy. The few little extra touches like the beach towels, bug spray, tea, and head torches were handy as well. Simone was a pleasure to deal with, can’t wait to book again! You can pick up the camper in Coburg at Simone's place. Campervan Estima for Hire for amazing journey around OZ!